Here’s Izakaya 87! In celebration of April Fool’s here’s an Izakaya chapter that’s loosely inspired by Roman Holiday. Never seen the movie? Neither have I. But it’s pretty famous, so I hear… For people a generation above me. Here it comes, and it don’t stop coming. Here’s one of the chapters I promised. People keep asking if we dropped things, but if we did, I’d have to make an announcement about it. I don’t like doing that. Anyways, what held this chapter up was a lack of available chefs certified to be skillful enough to put the final finishing touches on the chapter. Here’s another Iza for you. TLed by Shaun, edited and proofed by a lotta people. The next day at Izakaya Nobu, the sales of Toriaezu Nama were going through the roof. 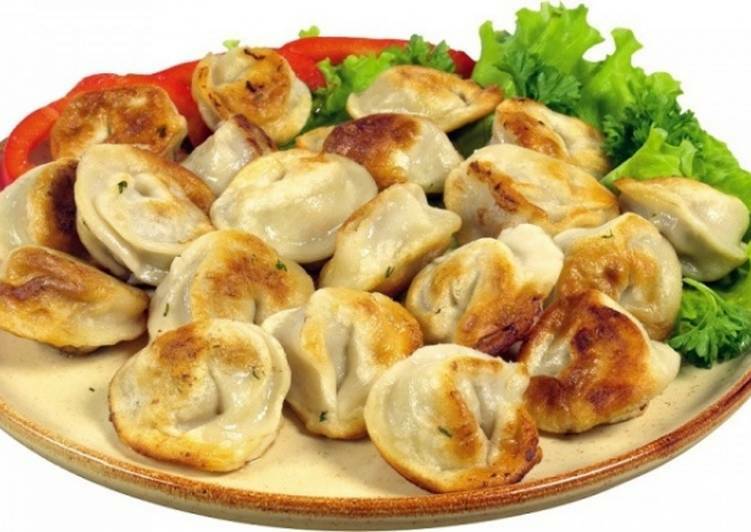 Hans’-style pelmeni sizzled in the frying pan, stimulating one’s appetite. Hans’ suggested addition to the menu was adopted within a day, with only a slight adjustment. Overhearing Shinobu and Taisho’s murmuring, he wondered if there was a similar dish in their world too. The pelmeni, seasoned with garlic, was called “Hans’ dish”, or “Hans”, because the official name, “Hans’-style pelmeni”, was too long to remember. His assignment, creating a dish that “went well with Toriaezu Nama”, had been accomplished, and the novelty of the dish contributed significantly to its popularity. For the steamed pelmeni, the potato starch that had dissolved in the water spread out like feathers. Apparently, it was fun to break the crispy part of the fried ones by spreading it apart with chopsticks. Customers who usually did not use chopsticks began using them by watching and learning from other people today. Among the customers who didn’t drink, there were many who asked for pelmeni and sasarica rice. The pelmeni, which was eaten with soy sauce or vinegar, went well with sasarica rice. Since it could be reheated at home, some customers ordered them as takeout. Shinobu decided to give these customers a small packet of sauce to bring back as well. She had been busy in the kitchen this whole time, stretching the wrappings. As he watched Taisho kneading the dough for the wrappings, Hans couldn’t hold himself in. His face loosened at the thought that everyone was enjoying the dish that he himself had introduced to the shop. This was it. This was what Hans wanted to do. Although he was merely at the stage of helping Taisho, he would definitely make his own dish and make his customers happy one day. The goal was far, but it seemed attainable now. There was sweat on Leontaine’s forehead, despite her being accustomed to handling the floor alone. Today was the busiest since the Grand Bazaar. Ever since Hans had decided to become a guard, the relationship between Hugo and Lorentz had been awkward, and he didn’t understand why. From his perspective, he didn’t think he had the talent for glass-smithing like his brother Hugo, but his father might not have thought the same. He wanted to clear up this misunderstanding as soon as possible. Hans was satisfied with what he had put out in the shop today and he had accomplished the task of making a dish that paired well with Toriaezu Nama. However, he wondered if he could still devise more ways to improve this dish so even more people would eat it. Taisho had added plenty of garlic in the pelmeni to pair it well with Toriaezu Nama, but it wasn’t suitable for female customers. If Leontaine, Shinobu, and Eva couldn’t eat it, then it wasn’t right for Izakaya Nobu. A customer’s voice called out, and Leontaine responded to it. When she turned around, her long hair swayed and tickled the tip of Hans’ nose. He wondered if Leontaine would drink tonight too. Before this, he only wanted to research on the pelmeni, but now, he was looking forward to it. A customer’s voice called out, and Leontaine responded to it. Here’s chapter of Iza after a long while! Well, here’s the ending to this mini-arc! I’m tired now… Gotta do work now. Here’s your Izakaya chapter! Translated by Shaun, Edited by Jou and Ele5, and Proofed by our loyal proofers.